The playful sand sculpture above was created on a beach in southern France. 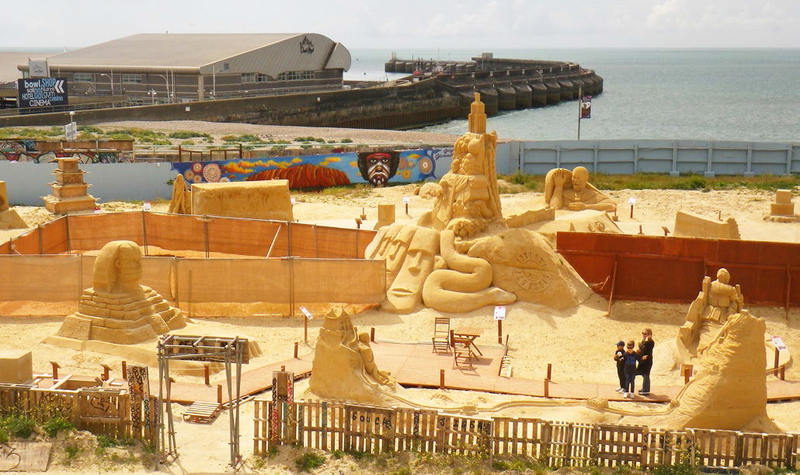 Judges reviewing installations at the Brighton (England) Sand Sculpture Festival. 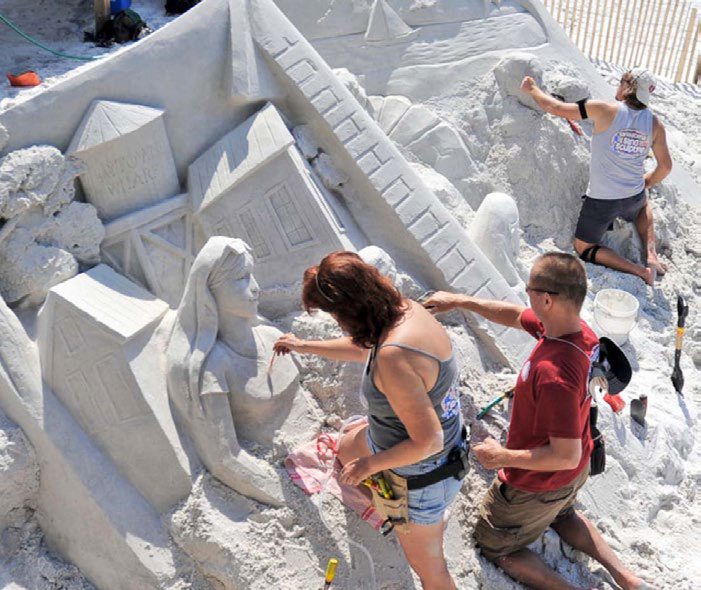 Three of the champion sand sculptors who spent six days in 2011 building an 18x10-foot piece at the Sandestin Golf and Beach Resort in Florida. Success as a sand artist came quickly to Kirk Rademaker—but was just as quickly snatched back. Kirk wasn't even a professional yet, just a talented hobbyist carving sand at Marin's Stinson Beach "as therapy" to counter the effects of a stressful job in construction. "But on Wednesday he called after pitching it to the board. 'Kirk, I'm so sorry, their reaction was, oh, sand sculpture. That's not art.'" Turning sand into castles, complete with turrets and moats, has attracted summertime beachgoers for generations, maybe centuries. Kids often do it for the pleasure of smashing their castle to smithereens as the tide washes in. Dan Belcher remembers erecting buildings of sand on a lakeside beach while studying landscape architecture at Kansas State along with other architecture students and professors back in the 1980s, never dreaming that within a few years he would be a professional sand carver. It was a profession that, when he first played with tiny grains of silica, quartz, and feldspar, did not exist. 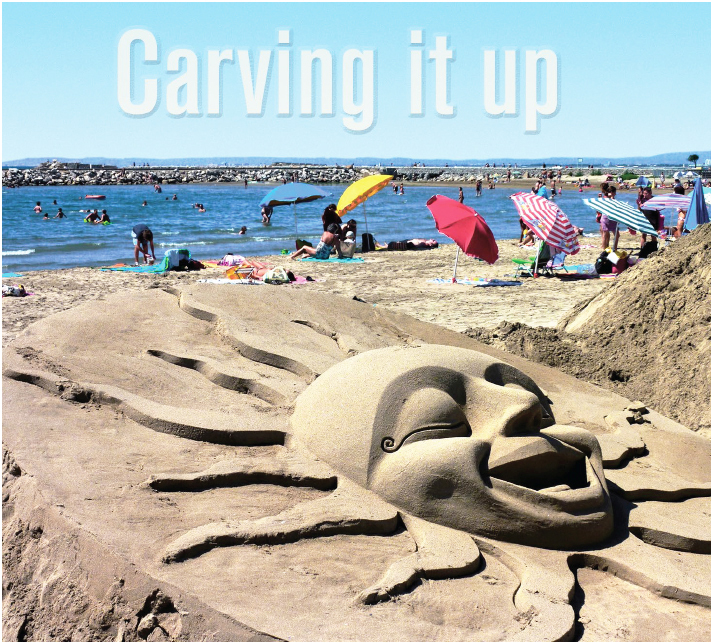 Indeed, sand sculpting as a modern, professional field only traces back to the 1970s, with two carvers in San Diego. Today, sand sculpting is an international phenomenon, with hundreds of small firms worldwide creating sand sculptures, some the size of small buildings, for corporate events, celebrity shindigs, and at popular public contests, often on beaches in the summertime.